I’ve put off reviewing Sanzoku no Musume Ronja’s for a few episodes now. Difficulty in ‘scheduling’ a review time with my toddler aside, this show provides very few opportunities to write more than a summary or note that children really like it. That isn’t an excuse for me to drop it. On the contrary, I enjoy watching this show. I just don’t have much to say about it. To summarize week 5: Ronja meets Birk, the son of the other bandit lord of the forest. Birk was born the same night as Ronja and,like Ronja, has come to emulate his father’s slightly smug, superior attitude. Like their father’s before them, these two immediately dislike each other. So, obviously, they have a leaping contest across hell’s gap and, eventually, Birk falls in. 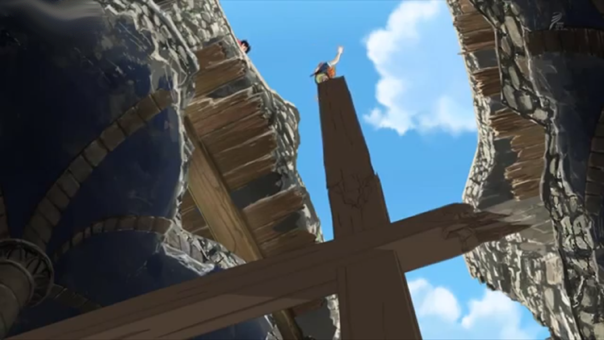 As this is a kid’s show, he doesn’t fall to his death but, instead, is saved by luck and Ronja’s rope. This scene was especially concerning for my three year old, who was enthralled with the leaping back and forth and totally shocked when Birk fell out of view. There was real panic in his eyes and fear to mirror Ronja’s as she tried to pull Birk back up. No doubt the following scenes where Mattis shouts at Ronja for ‘making up a story’ touched my child too. We aren’t in a ‘lie to daddy’ phase yet, but he knows being yelled at for doing dangerous things and I’m confident he could project his feelings and assumptions onto Ronja. 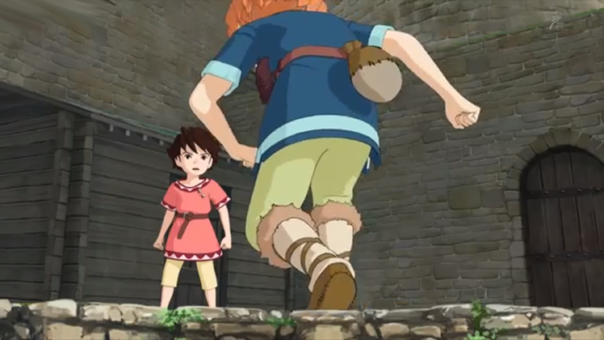 By episode’s end, the second bandit tribe is known to have invaded the northern half of the castle and Ronja’s dad is going to have to deal with that. Easier said than done! That’s 10 foot gap’s defensive advantage cuts both ways! As always, Ronja’s strength is it’s central characters. Mom. Dad. Little Girl and now a human friend slash enemy. 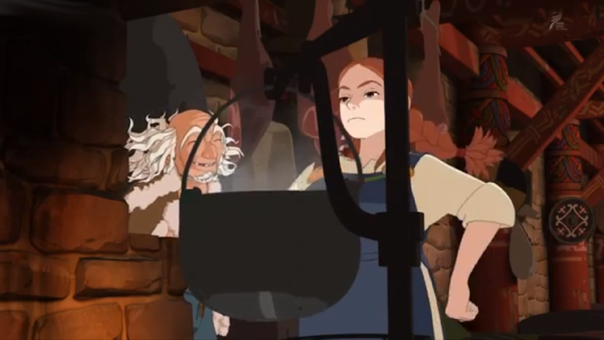 It’s charming to see Ronja’s expressions and body language ape Mattis’ and I’m starting to accept this would have been much more difficult to achieve without CGI.